Typically, leaders wanting to improve their organizations’ productivity focus on shifting from what’s wrong to what’s right, from what’s not working to what could work better. At ELI, we believe that long-lasting improvement comes from shifting our attention from what’s wrong and what doesn’t work, to what’s important. What’s important for me, for you, for the organizations and for all the stakeholders. Cultivating empathic leadership is the necessary gateway to make that shift, which gives leaders a true understanding of what productivity and collaboration mean and what it looks like. 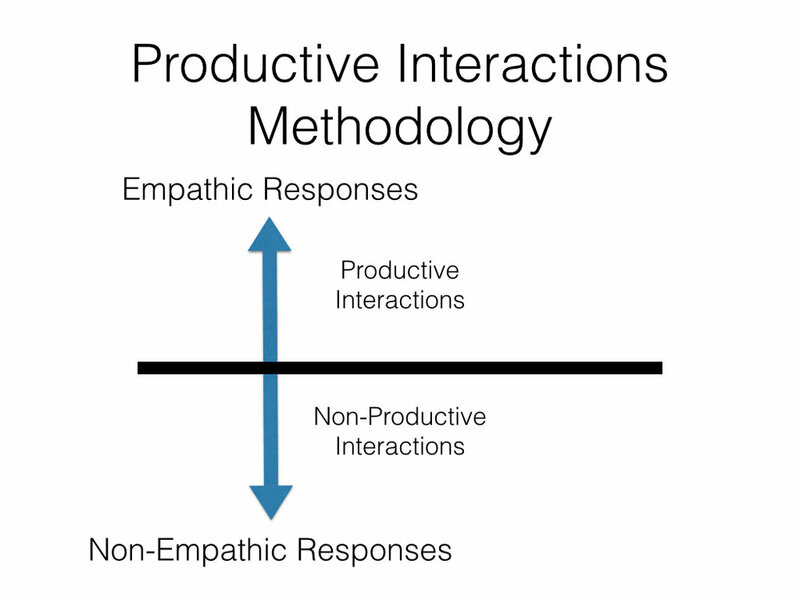 Studies such as Google’s "Project Aristotle" are making it increasingly clear that a central reason why organizations and groups achieve their purpose in a long-term and sustainable way is that the culture of the organization makes empathic responses a highly valued cultural norm. The presence of empathy (E) leads to psychological safety (PS), which in turns creates fertile ground for creativity (CR), collaboration (CO) and ultimately productivity (P). Even with great products or technology, organizations rarely thrive when non-empathic responses dominate the culture of the workplace. The Empathic Leadership Institute (ELI) is dedicated to support organizations to transition from non-empathic to empathic leadership responses, mindsets, habits and structures. This is achieved through our Productive Interactions Methodology™, which is a well proven approach to enhance creativity, collaboration and productivity at all levels. At ELI we understand that creating an Empathic Leadership mindset culture takes time and effort. Trying to tackle such cultural shift by a typical training program of management, human resources, etc. has been proven of limited effectiveness to obtain long lasting changes. Our extensive experience training and coaching individuals and organizations worldwide has lead us to adopt a more effective phased approach. These are the main phases we typically follow to infuse Empathic Leadership culture in an organization. We get to know you. Really. Deeply. This happens through video-conferences, interviews, assessments and surveys. The purpose is to first clarify what is important for all stakeholders and then to detect the current non-empathic responses in your organization. We then propose a plan to turn the non-empathic into empathic leadership using ELI’s Productive Interactions Methodology. Once we have an agreement, we move to the next phase: the Applied Implementation Sessions. In these sessions, we collaborate with people in charge to implement the empathic responses identified during the Initial Connection period. This implementation will be organized around the four dimensions: Self, Others, Group and Systemic. These sessions include the four components of our Productive Interactions Methodology: Focus on Needs, on Presence, on Clarity and on Expansion of Awareness. They are geared towards very concrete situations and workplace dynamics and the outcome of these sessions is that an empathic leadership infusion action plan is completed. Follow-up sessions are designed to support the implementation of the action plan through a variety of options ranging from email touch base to 1-1 coaching, group webinars or additional presence of ELI consultants at the workplace. These sessions are not an add-on; they are a structural part of our work. Effective implementation takes time and inevitably goes through turbulences and unexpected twists and turns, therefore asking for continued involvement from us. The comprehensive Programs are long term projects designed to infuse your organization with Empathic Leadership mindsets and skill sets and implement ELI’s Productive Interactions Methodology at various levels. We have identified three main applications based on where your organization is. For instance, ELI’s team can provide expertise at the very early stage of when a new organization is created, or we can team up with the leaders driving transformation and change within an existing organization, or we can intervene on a ad hoc basis to an existing organization which is going through a specific situation. Having our attention on Universal Needs is the key to productive interactions; needs provide a bridge between people on which everyone can walk and get on the other side together. On one hand, communication fallouts often happen because of misunderstanding or vagueness in what one person is asking of another. On the other hand, interactions also lose their productivity when people giving or receiving requests are not clear about the reason behind that request. PIM provides a path to infuse the interactions with deeper and truer clarity about intentions and purpose. When we lose presence, what we lose is the capacity to foster a productive interaction. Lack of presence, or lack of choice about how we respond, more often than not comes from an internal non-empathic response. PIM provides avenues to identify and shift these internal non-empathic reactions to empathic responses. Productive interactions happen when people can understand each other, and collaborate towards an outcome linked with the organization’s purpose and in alignment with its values. What often stops this from happening has to do with a lack of knowledge or a limited awareness. These blind spots might include knowledge about how our brain works, about the nuances of interdependence or about the complexity and diversity of human experiences. PIM infuses an expansion of awareness at these levels and more. François’ previous career was as a musician with Cirque de Soleil – he brings creativity and music into the rooms and hearts wherever he shares his work. He has an MBA from Sherbrooke University in Quebec is a Certified Trainer with the Center for Nonviolent Communication, and a registered corporate coach. In 2014, he wrote the book, “The Blame-Free State,” and has been helping people moving out of blame for others and themselves in several countries since then. Pablo Argon who holds a PhD in Applied Mathematics from Ecole Centrale Nantes (France) started his career in academia teaching while doing research. For the last 18 years he has been working in technology both in Europe and the USA at startups and large organizations both as an individual contributor and as a manager of international teams. Initiated to Nonviolent Communication in 2012 through workshops and trainings and seeing its benefits to all aspects of his life, he became passionate about learning and teaching NVC. Pablo is currently seeking to get his NVC Trainer Certification from the Center of Nonviolent Communication. As a Certified Trainer with the Center for Nonviolent Communication, Jared Finkelstein's work is fueled by his belief that an empathic quality of connection is what is essential in our increasingly connected world. The importance of a connection that embraces authenticity, honesty, and compassion was instilled in Jared at the Poughkeepsie Day School in upstate New York, a small K–12 private school that prioritized child-centered learning and community values where Jared's parents were teachers and administrators and he was a student for all of his formative schooling years. Family, community, and schooling all threaded together during his childhood, and this experience has fueled his work and personal philosophy. Marshall Rosenberg’s vision of life-serving systems — organizations and communities that weave the practice of Nonviolent Communication into the very fabric of their institutions for the purpose of creating peace and sustainability has been hugely influential upon Jared. For the past ten years he has put his passion into manifesting these sorts of communities as a team member of the NVC Educators Institute’s flagship training program, Teach for Life, and as an active contributor to NVC Family HEART Camp, all age 24/7 immersions into compassionate community and collaborative learning. Jared lives and works in Berkeley, California. Irene has years of experience as writer, editor and communication consultant. With a Communication degree from Purdue University, Irene began her career writing and editing for consumer and trade publications, later working as a communication consultant in an international management consulting firm. In this role, she developed complex communication and training projects. In 2004, Irene discovered NVC and began integrating and sharing it, and is pursuing Trainer Certification through the Center for Nonviolent Communication. Irene is a member of the Oberlin College Center for Dialogue which provides mediation and facilitation to the College and community. She taught a popular full-semester NVC class at Oberlin and continues to offer workshops for student groups and departments at the College, as well as classes in the Cleveland area. We'd love to hear from you. We'd be more than happy to get a sense of the support you're looking for and assess if we might be a fit for that.